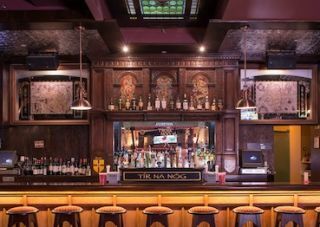 Manhattan has no shortage of Irish-themed pubs, but Tir Na Nog on 39th Street is a cut above. Step in out of the bustling midtown traffic and you're instantly transported to a High Street local in Galway or Cork. The décor is at once authentic and unconventional, down to the LED-laden 300-year-old Irish rowboat, replete with fishing net, on the ceiling. "The owner, Tony Colbert, owns several Irish pubs and takes immense pride in the design of each of them," said Rich Trombitas of Cornwall, NY-based Cardone, Soloman and Associates. "He imports woodwork that's been salvaged from churches built in Ireland in the 1700s and 1800s, then they design the individual detail to fit the space, and the woodwork is all done by master carpenters. The architecture and décor is simply magnificent - it all looks like it's been there for centuries." Trombitas says the owner was adamant that equal attention be paid to the pub's audio system, which includes a cross-section of Renkus-Heinz TRX and CFX Series loudspeakers as well as PNX and BPS subwoofers. "Tony made it clear that he wanted more than just background music," he said. "He wanted a system that sounded consistently great no matter where you're sitting, and blended seamlessly with the design of the place." "The coverage of the TRX-Series aligns perfectly with what we needed to accomplish in this space," said Trombitas. "The rotatable horn enabled us to mount the units either vertically or horizontally, depending on what worked better in that particular space." CFX41 compact 4-inch two-way coaxial boxes are mounted over the booths for added reinforcement. "Their level is down pretty low, about 8dB lower than the mains, just to fill in the mids and highs when the place is crowded," Trombitas said.